This cathedral stands at the Petrogradskaya Side in Blokhin Street. The architectural style of this cathedral is a combination of baroque and early classicism. On the place of the present cathedral in 1708 the wooden church was laid. Between 1712 and 1717 it was replaced by a stone church. In 1740 Anna Ioannovna signed the Ukase to build a new cathedral. This cathedral was de­signed by the architect Pietro Trezzini. On the 25th of November 1741 Elizaveta Petrovna ordered to change the project of the cathedral. She gave the architect Mikhail Zemtsov a commission to create a cathedral in the style which is traditional for Russian church architecture. The architect was offered to use the composition of the Us­pensky Cathedral in Moscow. It was decided to raise a cathedral of five cupolas and a high bell-tower. In 1741 the erection was started. How­ever, in five years the construction works were stopped. In 1766 the construction of the cathedral was renewed after the project by Antonio Rinaldi. In June 1772 there was a fire in the cathedral. It interrupted the construc­tion works for a long time. In 1783 the construction was continued. 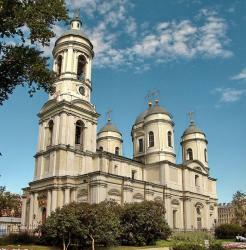 The architect Ivan Starov supervised the res­toration of the cathedral. In 1789 the construction was completed. Between 1882 and 1886 next to the cathedral the stone bell-tower was erected to the project of the architect Nikolay Kovrigin. The bell-tower was constructed in the memory of the tsar Alexander II. On the 1st of March 1881 he was mortally wounded by a bomb on Griboye­dov Canal Embankment. On the 1st of October 1789 the main altar in the name of St Prince Vladimir was sanctified. St Prince Vladimir’s Cathedral became one of the best temples in St Petersburg. The outline of the cathedral is simple and elegant. The cathedral is crowned with four small side domes which successfully match with a large central one. The architectural ensemble of the temple includes a bell-tower. It has a cubic form in its lower part and cylin­drical in the upper part. This bell-tower is organically merged with the architectural ensemble of the cathedral. The interior of the temple is magnificent. The temple hall is divided into three parts. The walls are decorated with pilasters. There are some copies made from the pic­tures of the famous artists, Paolo Veroneze, Raphael and Victor Vasnetsov. The wonderful pictures decorate the church hall. They could belong to the brush of the fa­mous artist, Karl Bryullov. The iconostasis of the temple is a fine example of an artistic wood carving. In 1926 the cathedral was closed, but in 1927 it was returned to the believers. Now the services are held in this wonderful temple.